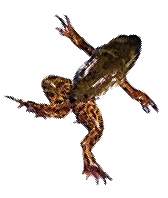 A collaborative effort among several university and USGS scientists has shown that malformations in amphibians in several western lakes were related to the presence of infections caused by a parasite (Ribeiroia Ondatrae) and were not related to a variety of other suspected factors, including the presence of pesticides in the aquatic environment. The team of scientists analyzed 12,000 individual amphibians representing 11 different species and, for the first time, have linked limb malformations to parasite infections on a regional scale. Amphibian health is intricately dependent on the health of the aquatic environment and therefore amphibians are excellent indicator organisms of environmental contamination. The lack of a relation between pesticides and amphibian limb malformation found in this study has removed lingering doubts that the two were linked and enables scientists and resource managers to more accurately focus their continuing efforts to find causal mechanisms related to amphibian limb malformations and amphibian health in general. Johnson, P.T.J., Lunde, K.B., Thurman, E.M., Ritchie, E.G., Wray, S.N., Sutherland, D.R., Kapfer, J.M., Frest, T.J., Bowerman, Jay, and Blaustein, A.R., 2002, Parasite (Ribeiroia ondatrae) infection linked to amphibian malformations in the western United States: Ecological Monographs, v. 72, no. 2., p. 151-168. Malformed Frogs in Minnesota--An Update: U.S. Geological Survey Fact Sheet 043-01.